If you’ve never used t-shirt yarn before, you gotta try it! I got to try the popular Hoooked Zpagetti yarn from Love Crochet and it’s fantastic! I’m going to tell you all about it plus there is a free downloadable crochet pattern at the end for the rug I made with it! 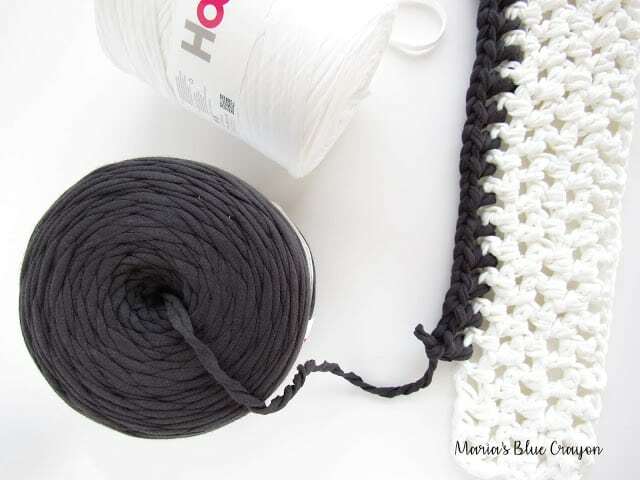 So let’s start with the details of the Hoooked Zpagetti yarn. 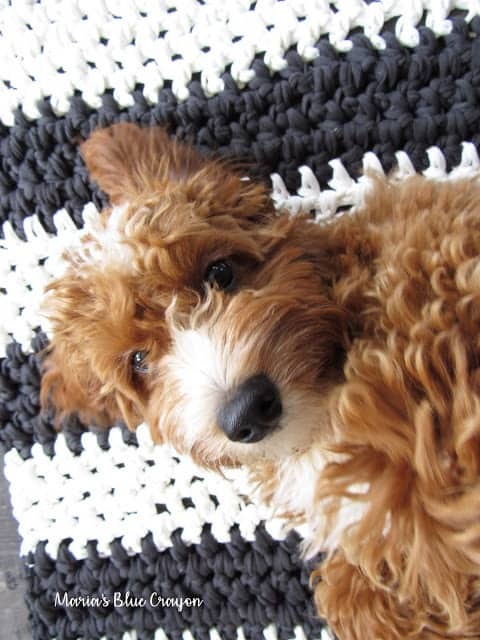 This is a lot of yarn! Although each skein is 131 yards, it’s super bulky so you get a good amount! I was also pleasantly surprised at the softness of the cotton. 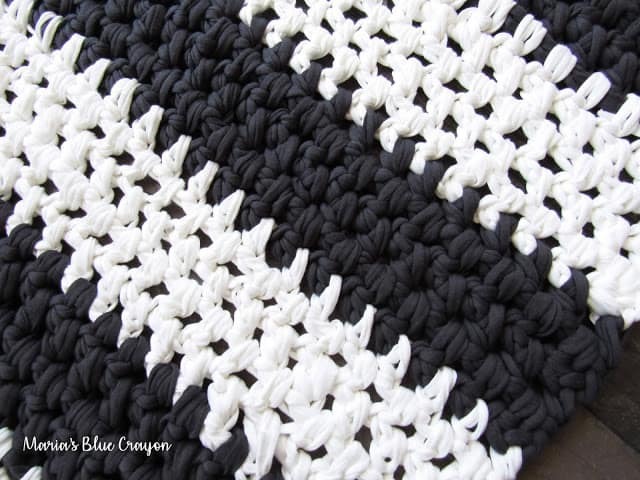 If I were to cut up one of my t-shirts, I don’t think it would be as soft as this recycled cotton yarn. One thing I did notice about the yarn when I was working with it is that the thickness was not consistent throughout, specifically the white color I used. (The dark gray color I used was consistent throughout). It did not effect the outcome of my project, but it’s just something that caught my eye when I was using it. 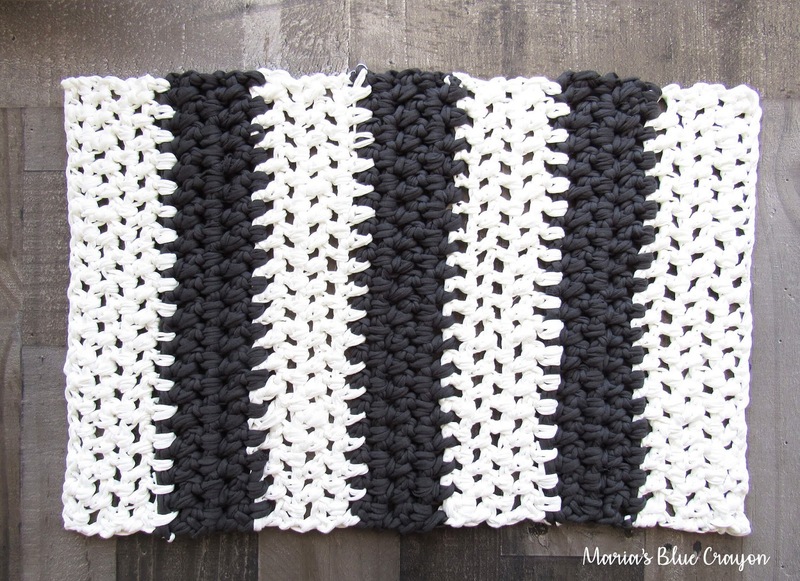 This t-shirt style yarn is perfect for rugs, so I made a simple rug with striping! I will be using them for my bathroom and I’m already loving how thick and sturdy it feels under my feet. I went with a really simple stitch except I mixed it up just a bit. 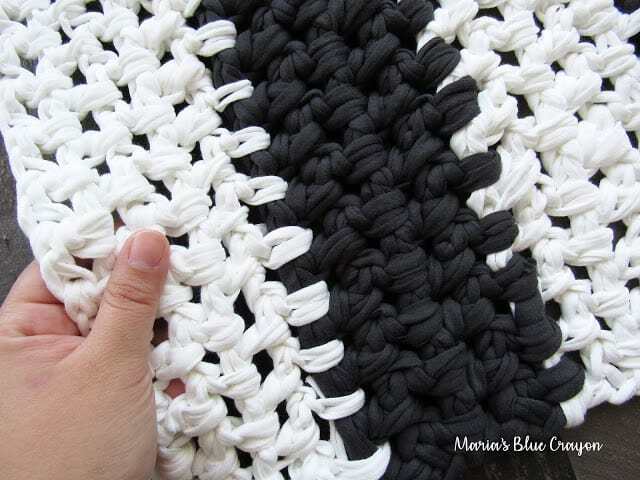 I used the moss stitch (also known as linen stitch and many other names) but instead of doing the traditional single crochet with this stitch, I swapped it for half double crochets for a looser stitch (plus it works up much more quickly!). My puppy has already partially claimed it.. his favorite spot to snooze during the day is in the bathroom (although I find it a rather odd spot to sleep) so he will be using it a lot! Since this pattern is so easy, I’m offering the ad-free PDF printable/downloadable for free to everyone.